EDIT Nov-2010 There is an easier way to compile native C code, see this article. A recent project I’ve been working on required Bluetooth programming on the Android. Having a quick look over the latest 1.5 Android SDK, I could see that bluetooth support was missing. Later research pointed out that Google expressively excluded Bluetooth APIs blaming lack of time. On the other hand, I’m not a big Java fan, to say the least. I find Java unfriendly, and I don’t like the look and feel of Java apps. Sorry, I prefer C/C++ since it provides better control and flexibility. So it’s time to start doing C/C++ native applications for the Google Android. How run a C program on Google Android? First thing I’ll show here, is to compile a simple C program for the Android. Save this program as test.c. In the next steps we’ll be compiling this sample for the Google Android using gcc. 1. Download ubuntu linux. I currently use Desktop edition 9.04 in a virtual machine. 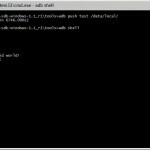 Attention: You’ll need to install Ubuntu on a machine with at least 1.5GB Ram, 10GB ext2 partition and 2GB Swap partition or you won’t be able to use this tutorial’s info (less then the minimum requirements will result in the impossibility of compiling the Android Code and we need that for the libraries). When prompted, configure Repo with your real name and email address. If you plan to submit code, use an email address that is associated with a Google account. Your client directory should now contain a .repo directory where files such as the manifest will be kept. For more about repo sync and other Repo commands, see Using Repo and Git. 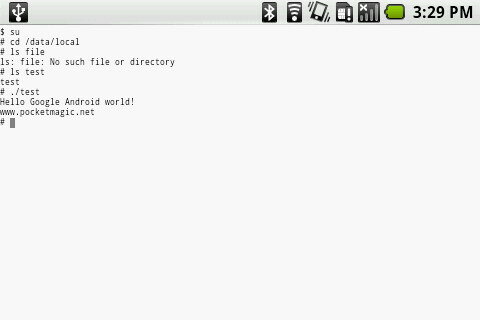 The Android source files will be located in your working directory under their project names. then paste the key(s) below, and press Control-D to end the input and process the keys. key 9AB10E78: "The Android Open Source Project <initial-contribution@android.com>"
The Android code contains a bug that hasn’t been solved up to the date of this article. On my virtual machine running ubuntu, the build process took several hours. The host PC is a 2.6GHz P4. Android uses a simplified version of libc, called bionic. We need to compile using Android’s prebuilt cross-compiler arm-eabi-gcc, and use the bionic library on the phone. Or download this updated version directly. Next thing to do is to try to control the bluetooth functionality using native C code and the android toolchain. More on native C apps for Android here. Great. Thanks for the instructions. Any idea how start your C program when the system boots up, or after it boots up? That’s only for ubuntu intrepid users. You won’t need it in 9.04 desktop. I’ve modified the post to reflect this as well. Just a little modification, you need to change agcc, as the toolchain is not correct libgcc.a is not anymore in interwork folder, so 2 lines needs to be changed too. Great. works like a charm. @Dorian: thanks for the correction. I have the environment for building a C code for android 1.0 in the ubuntu machine. Now I have downloaded Android 1.5 SDK for linux and want to compile the same C code for Android 1.5. What changes I have to make ? I am using android X86 (taken on 10 oct ’09). /system/bin and data/, then I’ve build the iso and boot it up. I can see my hello, but. The shell is dumb or…. The both folders are in the path but I am still getting the same error. It was working well few months back but now when I tried again I am getting the above error. Hey there Tayefeh, funny to see that isn’t it? The truth is you can make sore very powerful apps using the JNI. I’ve implemented a complete bluetooth l2cap interface for Java using it. Will post more soon. Very nice explanation! you saved my time. All in one place solution! Thanks! I’m glad you like it. Make sure you read about JNI as well: it provides some more options. One more thing – I’m trying to run a sample ‘hello world’ program using a .cpp file instead of .c file. Compiler complains of not finding iostream.h. Could you tell me how to use your script to call a c++ file? Can you write the same agcc script for mips based system? May I ask, what MIPS android hardware do you have? I already have android running on it but my 3rd party software which is generally used in glic environment will not work under bionic based android. So I was wondering can we make such wrapper for mips based systems. I have set the PATH too correctly. Kindly please help me. hello , please do, I think that will help the community. 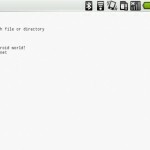 mavci, you can use the terminal application for android. I will write all explainations tomorrow. Ok, then I can add them to this post, so others can use it too. this is so dope. I can compile all kinds of console programs now! glad you like it, Quincy . Can’t seem to get the gpg –import section to work. How exactly do you paste the key in? Gcc 4.3 is required for building android. 4.4 has strict has more strict rules so it will through fprintf declaraion errors..
Hello Anup, Thanks for your contribution! I am not at all a technical person, so when it comes to understanding code, this feels foreign to me. However, from what I’ve read, you’ve found a way to include blue tooth functionality with C++? That’s actually kind of cool in my opinion. If you don’t have bluetooth, you make it yourself. Hi, Thanks for the great tutorial, it worked like a charm. I’m having trouble using GDB. I want to know the loaction of the system and exit call addresses, using the command “p system”. GDB keeps giving me an error “no symbol table”. I’ve gave GDB the correct paths before attching to the process and used the “shared” command. I’m really struggling, Has anyone got any clue to why this is happening. Slightly off-topic, but not really. You talked about implementing a bluetooth L2CAP interface for Java. I have done something similar and am trying to open a L2CAP socket to listen for incoming connections. But when I try to bind to a native L2CAP socket using JNI, I get error code 13 (permission denied) returned to me. When I try the same thing using RFCOMM, it is successful. I’m interested in your interface that you wrote and I’m curious if it behaves the same. Hi Greg, yes I’ve used JNI (and some other attempts) to open a L2CAP server socket and it failed on most of the Firmware versions. However it works on older Android OS versions (< 1.5), also on newer versions depending on the channel you want to open. What do you mean by "I try the same thing using RFCOMM"? I noticed that the Android API has support for L2CAP (all the way down to the native code), but it all marked private. So I attempted to access the private stuff via reflection and it works great for opening up L2CAP sockets to other devices. But when trying to open a server socket, it fails. I was thinking maybe I was doing something wrong, so I used the same technique for opening an RFCOMM server socket (basically use TYPE_RFCOMM instead of TYPE_L2CAP). I realize that the public API has support for this, but I was trying to prove that using the reflection technique also works, and it does. So my conclusion was that L2CAP server sockets must not be supported. And your findings seem to support that theory. Have you investigated any further to figure out where the permission problem is coming from? Do you think this was a bug introduced in 1.5? Or is it an intentional security feature? I’m trying to open up L2CAP server sockets on psm 0x11 and 0x13. Hi Greg, I’m not sure about that. Can you post the code as you did the reflection approach for accessing the private l2cap methods? I would give it a run on my side too. Also I need to ask, if you open two PSM sockets with L2CAP, how can you do the same with RFCOMM? Does it work for you? When I say RFCOMM works, I meant that creating the RFCOMM server socket and calling bindListen() on it (all via reflection of course) returns error code 0. I didn’t actually service any incoming connections, but I’m assuming the socket was open and listening. However calling bindListen() on an L2CAP server socket returns error code 13. Same code, just a different type constant passed into the BluetoothServerSocket constructor. I don’t have access to my code right now, but I will post it as soon as I can! Here is my code. Not sure how well this will copy into the browser. Should be pretty easy to follow, just invoke the public static method. Let me know how it works! I’ve reformatted the code using the < .pre lang="java"> tag. I will try this code soon, please give me some time. Hope there is a simple solution. I have written a small program that retrieves the time from a daytime server (time.nist.gov). 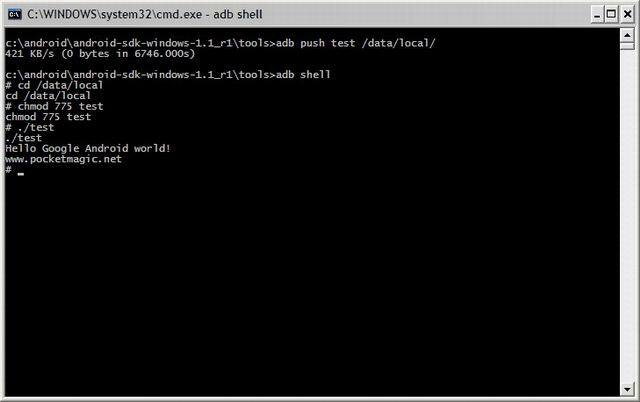 Thru adb shell it runs fine. I need a mechanism to execute it without the use of adb, preferably directly on the device. // android.os.Exec is not included in android.jar so we need to use reflection. // NOTE: createSubprocess() is asynchronous. Instead of /system/bin/ls use your Own path to your executable. The second string (/sdcard) is a parameter you can send to your executable. For mre info read about android.os.Exec and createSubprocess. // It seems IOException is thrown when it reaches EOF. // Waits for the command to finish. Im getting a class not found exception. how can I get rid of that problem? please post the complete error details, including the line where you get the error. Surely, this is not the correct technique to get rid of the error. Does anyone know of a tablet running 2.2 or is flash capable? I now have some time to look over this, looking at the code I see it uses reflection to use the access the private BluetoothServer socket methods. To save time, could you post the BluetoothClient socket part as well? I would like to run a quick test on my android. Hey Radu, thanks for giving my code a try. Is there more to the stack trace? A caused by perhaps? You’ll notice that when I throw the runtime exception, I am wrapping another exception. I’m curious what exeception that is. I’m assuming it’s going to be permission denied error, but I just want to make sure. any idea how to overcome this? Your stack trace is different from mine and shows that you are failing in a different place. You are failing in initSocketNative(). On my device, initSocketNative() succeeds. But the later call to bindListenNative() fails with permission denied. Perhaps this is just a difference in devices. Are you testing on an HTC device by any chance? I know HTC has some differences in bluetooth. I am testing on a Moto Droid. Interesting. Your complete stack trace matches mine exactly, but the partial one didn’t. That’s strange that it’s different now. Ok, so we fail in the same place. At least we are consistent! Now to figure out why bindListenNative() returns the permission denied error. Actually that was my mistake, for the first trace , the test app did not have the bluetooth permissions in the AndroidManifest.XML file. So I corrected that, and the second trace is ok.
find /system/lib/bluez-plugin/input.so on your Android device, and rename it to something else. Reboot and try opening 0x11 or 0x13 again. Does this work? I tried ports 0x1 and 0x2. Neither worked, same permission denied error. I also renamed input.so to input.so.bak and tried again on port 0x11, permission denied. I rebooted and tried again, same error. Yes! Finally someone writes about linux tutorial. Your technology blog is really very informatic. Thanks ..